German Colony. Wilhelm II Proof Rupie 1911-J PR66 NGC, Hamburg mint, KM10. I showed this to the cataloger sitting next to me a few times over several hours throughout the day. We passed Wilhelm II back and forth. His reaction was the same as mine every time or vice versa. Both in awe viewing the colors. This is not a "toned" coin per se. Rather it's an unfair representation of intense colorful metallic brilliance that the eye cannot stop craving. Father time has outlined the cameo and character designs with the following electric neon watery colors on the obverse that consist of : turquoise, light baby blue, champagne, and traces of merlot. The entire reverse is : sun yellow, tangerine, merlot, purple, blue, sky blue, and traces of champagne. Did we mention there isn't a single nick on the rim and this happens to be the only proof certified by NGC? In addition the strike is razor sharp and the coin is nothing short of electrifying to view in hand for the enthusiast who appreciates gorgeous surreal colors. 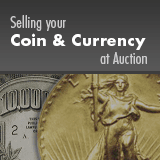 Please view this coin during our New York auction if you have a chance to appreciate its captivating beauty in person.